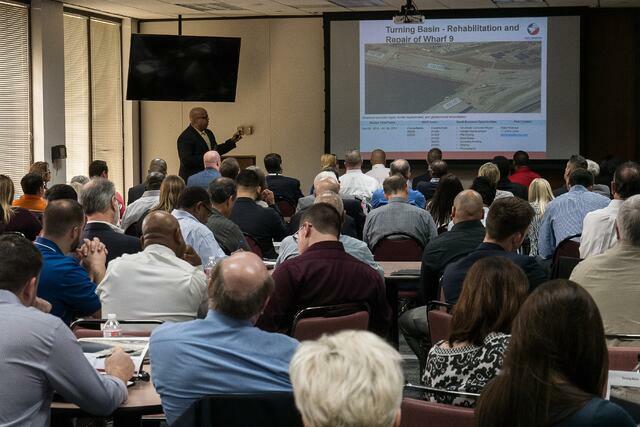 Port Houston’s Small Business and Education Outreach Department held an industry Capital Projects Forum Feb. 15 at the port’s executive building. More than 300 small business representatives attended. The port’s small business Team was onhand to address questions about the benefits of being registered in the Small Business Development Program. Akilah Hicks, Small Business Coordinator, welcomed attendees and discussed the port’s Buyspeed Procurement System and how to get registered as a port vendor as well as mentioned upcoming small business event opportunities. Don Smith II, Construction Manager for Port Houston, provided a presentation on upcoming construction and design projects at the port’s Turning Basin docks, Care Terminal, Barbours Cut and Bayport container facilities. “The type of work for every project changes at each location depending on the facility’s needs. These range from structural repairs to rehabilitation of wharves and more,” said Smith. Smith also outlined the general steps for port contractors after the award process for bids and proposal submissions as well as final project implementation and review. “This is a busy year for the port because we are continuing to expand our assets at our container facilities to accommodate more cargo,” added Smith. In 2017, Port Houston completed more than $200 million worth of construction contracts for port terminals.